Once Tune Sweeper has identified the duplicate groups in iTunes and you have selected which tracks in those groups you want to remove, you are ready to let Tune Sweeper delete the duplicate tracks in iTunes. Use the 'Remove Duplicates' button to do this. 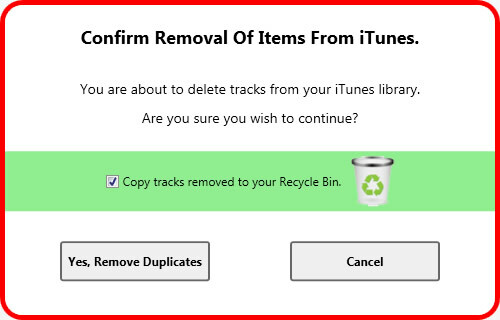 You can optionally select that Tune Sweeper will copy the tracks it removes from iTunes to your recycle bin. This will allow you to restore the tracks from the recycle bin if required or empty the recycle bin when you no longer require the files and want to claim back the disk space they are using. 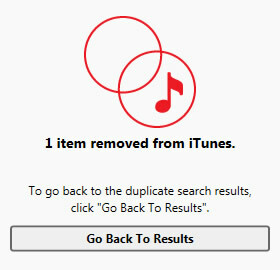 Start Removing Duplicates from iTunes. Once you have selected 'Remove Duplicates' and set whether to copy deleted tracks, click 'Yes, Remove Duplicates'. Tune Sweeper will start iTunes and begin to delete all of the duplicate tracks not marked as "Keep". Once Tune Sweeper has finished deleting duplicates from iTunes, you will be able to go back to the search results and remove any further tracks.